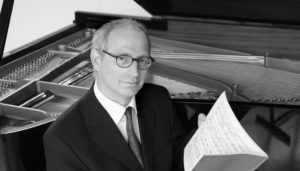 Sander Sittig from the Netherlands teaches chamber music, piano accompaniment and artistic research at the Rotterdam Conservatory “Codarts University for The Arts”. After winning prizes at several international piano competitions he embarked on a career that took him all over Europe, the Far East and the USA often as a partner of famous violinists such as Shlomo Mintz, Ilya Grubert and Liza Ferschtman. Sittig recorded solo compositions by Mozart and chamber music on CD and performs regularly for radio and television. His recitals are famous for his lively and informative talks, often with multimedia support. Sander took part in the peace music project “Violins of Hope”. His engagement to the music and young people is devoted and committed.